This article explains how to read articles in Pocket using Firefox, and how to adjust your viewing preferences. 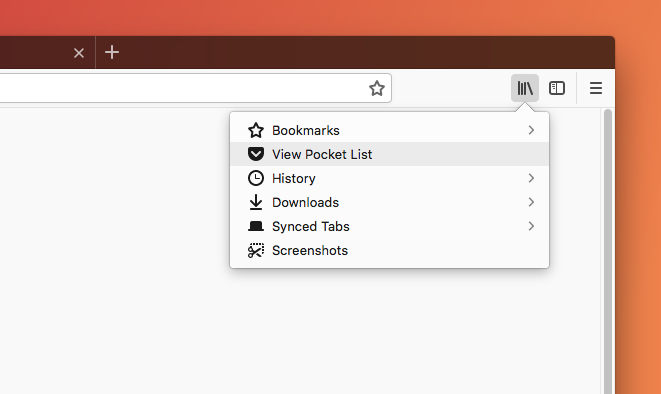 To view your List in Firefox, click on the Library button and select View Pocket List. We also recommend pinning the Pocket tab in your browser so it’s always accessible. To pin the tab, just right-click (or control-click) on the Pocket tab and select Pin Tab. Click on an item to open it. When you open an item in your list, articles will be displayed in Article View. This distraction-free, easy to read format is designed to deliver the best reading experience in Pocket. When viewing other items, they will open in a separate tab in their original form. You can customize Article View to create your ideal reading experience. To make changes, click the Display Settings button in the top toolbar. Here, you can control font style, text size, and reading theme. Click the Share button in the toolbar to view your sharing options. Send to Friend - Send to Friend makes it easy to share items with others without leaving the Pocket website. Learn more about Send to Friend. Permanent Copy - If you subscribe to Pocket Premium, you can view your permanent copy of this item. Learn more about Permanent Library.